The inflatable awning solution for your Eriba caravan. There are four sizes specifically designed to fit the different sized Eriba Touring caravans, but these will also fit other pop-up caravans depending upon their height and length. The Pop awnings have a clever dual height system that means that they will fit pre and post 2010 models (260 Puck model only pre-2010). Freshly updated for 2019, the Pop AIR Pro now allows for the fitting of an optional Sun Canopy to the front of the awning as well as an optional Pop Annexe to replace either of the removable side panels. 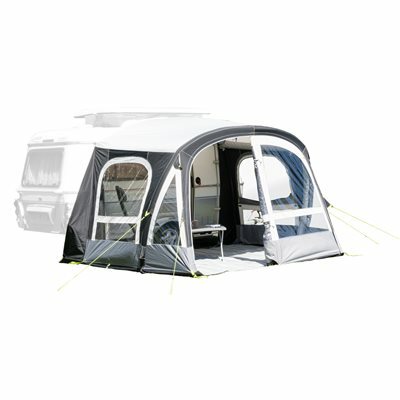 The rear of the awning has an extra inflatable tube that raises the centre height making it a full height awning with plenty of headroom and a light airy feel. The Pop AIR Pro has plenty of windows for a great view out and closable mesh panels provide ventilation where needed. Due to the design of Eriba caravans and the fitment of the awning, we recommend the use of our optional Eriba Weather Protection Strip. This simply clips to the caravan gutter and prevents rain running into the gully between the caravan and awning. Optional Front Canopy shown in the images.